Next month on March 8th and March 9th JavaLand will take place in the theme park Phantasialand in Cologne, Germany. 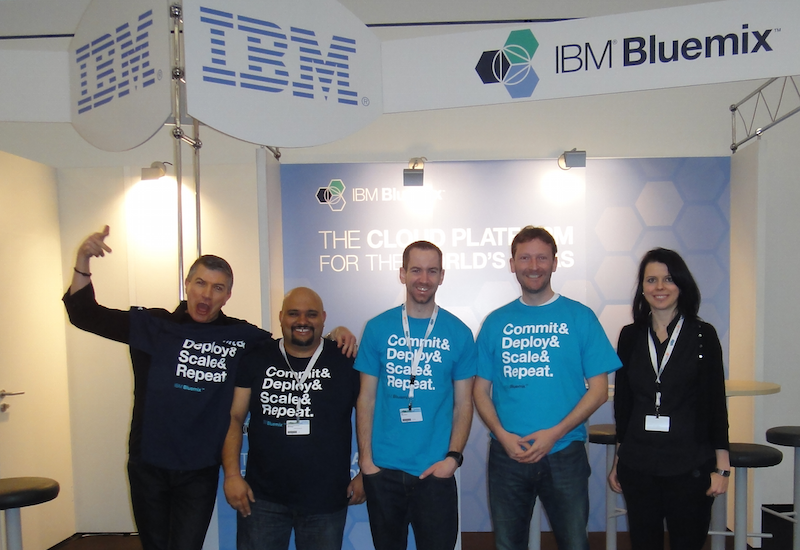 After our positive experience last year, IBM sponsors JavaLand again this year. My colleagues David Barnes and James Thomas and I will present IBM Bluemix at our booth and in sessions. At our booth you can not only learn about Bluemix, but we will also have two lotteries on Tuesday and Wednesday where people can win two GoPro Hero Black 4 cameras: 4:50 PM on March 8th and 3:50 PM on March 9th. David would like to record some videos with developers who have used Bluemix to build cool apps. Check out similar videos that David has done previously to get an idea of the type of interview he’d like to do. If you are interested, please contact me either onsite or via Twitter (@nheidloff) or email (niklas_heidloff@de.ibm.com). At our booth I’d like to show the Anki Overdrive demos to steer cars via speech recognition and gestures via Leap Motion and Kinect with Bluemix and IBM’s Internet of Things platform. Here is a list of our sessions. There are often disagreements on the precise definition of DevOps, but one thing is clear: developers are now becoming responsible for things that were once the job of Operations. At the same time, users are demanding new applications at a dizzying pace. Combined, these changes bring great news: developers are becoming more vital to the business than ever before. But, with great power comes great responsibility. How do we deal with these new operations tasks while still meeting the demands for new applications? The answer, as always, is for us to learn new skills and to choose the right technologies to help us. In this session, you’ll hear from David Barnes, the Program Director of Emerging Internet Technologies at IBM. David will demonstrate how a you can use cloud based services and containers to abstract the complexity of operations so you can focus on what’s important to you: creating great applications. With the availability of new platform stacks and new tools, the coding of applications has become a lot easier over the last years. However a key problem of software development often still occurs which is the challenge of rapid deployments in different environments  development, testing and production and both on-premises and cloud. The typical developers excuse it works for me doesn’t count anymore. Instead today developers are responsible for the complete development cycle up to the deployment and testing in production environments. Fortunately Docker addresses this challenge and makes it very easy to deploy applications in different environments. This empowers developers and allows them to be really innovative by focussing on writing code to go from concept to production in minutes rather than months. In this session we are going to use the Cloud Foundry implementation IBM Bluemix to get applications deployed to the cloud by leveraging the power and portability of Docker containers. Well talk about everything from build pipelines, to private registries, container monitoring and more. Are microservices a wonder-pattern for rescuing intractably complex applications? Or are they just a restatement of the software engineering best practices we all should be following anyway? Or something in between? How do they work? How should they be written? What are the pitfalls? What are the underpinning technologies? Here is a photo from the team and the booth last year.